I'm the developer of a renowned DAM software for Windows. I also use the awesome Affinity Designer personally. 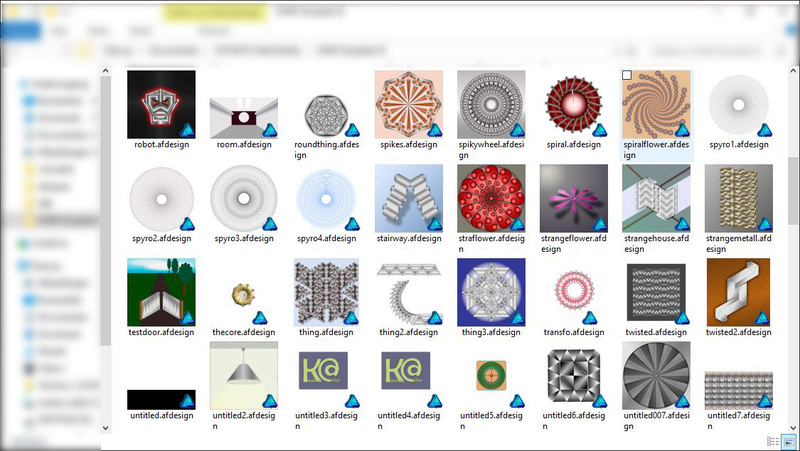 My software supports over 100 file formats so far. I would like to add extended support for files created with Affinity Designer and Affinity Photo to my software. Is there any documentation available for the .afdesign and .afphoto file formats? I'm especially interested in ways to render a suitable preview / thumbnail of your files, and in reading and writing metadata. I'm afraid our developers have no plans to make our apps file formats public, so that third party apps cans handle them. As we are planning on developing our own DAM application to manage them. Affinity files contain very useful previews in OSX. Seems there is no such preview available in windows? If it is available it should be good enough for DAM use. I have no plans to edit your files. But being able to see a preview for them in Windows Explorer and in my DAM would be very welcome. We already discuss this in the community for my software. Does your file format support some kind of embedded preview? Maybe you can supply a shell extension like Adobe does so we can access the preview using the standard Windows API functions for previews. As of you plans for developing your own DAM: Great. But I would very much prefer, not only as a DAM developer but also as a user of your software, that you at least document if and how you store metadata like XMP in your files. Proprietary file formats are all good and a nice way to lock your customers into your software. But even Adobe documents how XMP data can be read and written in their file formats. Adobe! Unfortunately our file format is not a conventional format like other image formats. It has been engineered with a number of requirements in mind, including fast iterative saves, scalability for fast initial opening, and to enable us to provide a single file format across all our apps whether it be raster, vector, multipage, etc. It also uses a very dynamic approach to saving document data, which would make it very hard to document in any meaningful way. This was in no way an attempt to "lock in" our users. There is no other standard format that can achieve what we do. Anyone working on large raster documents should appreciate how much faster we can load and save our file format compared to other apps. We do embed some preview images in our file. The details of this are currently under review as we expand the requirements of our format, so at this time we won't be releasing any information on this. It is possible that we may provide details on how to access the preview image data at some point in the future, provided it requires no further details of our proprietary format. The problem we have is that if such information becomes public, then we have an extra responsibility to anyone who uses it - and that limits our ability to make changes. thank you very much for giving us some details and background info. I'm really not interested in the inner workings of your file format. It's perfectly valid for you to keep your file format proprietary so you can change it whenever you need to. I fully understand that. What I would like to see is a standard/documented way to extract a thumbnail/preview image for .afdesign and .afphoto files. Like it exists for PSD files, DNG files, TIFF files, MP3 files etc. Or maybe a shell extension for WIndows which allows Windows to pull a preview from your files. This would not only allow us to see previews of .af* files in Windows Explorer (which we currently can't and that's a real nuisance) but also would allow all Windows applications to use the standard Windows shell functions to extract the thumbnail / preview. If you supply such a shell extension with your applications, you don't need to reveal anything about your file formats. A more modern approach would of course be to provide a WIC codec for your files. WIC is the official approach on Windows to support RAW files and other file formats. Your WIC codec would allow applications to extract a thumbnail/preview without knowing anything about the inner workings of your file formats. I could not find any information if your software allows users to edit EXIF data or XMP data. I checked in Designer but I could not find any way to input title, description, keywords, author, GPS data etc. If you already have or plan to add support for XMP soon, it would be very nice to do it in a way that allows other applications to read and write that metadata. Its usually important for private photographers, but a must for pro photographers. Phil Harvey, the author of ExifTool, is surely willing to support your files in his application and library. ExifTool is the de-facto standard for dealing with metadata on all platforms. I would find a preview in ptc's DAM software very useful. Also, it does seem a little odd not to be able to see an image preview in Windows Explorer. Then Affinity is doomed. It might struggle along for a few years but it will become a 'me too' product. If you intend to break free of the hegemonic stranglehold Adobe has on the computer graphics software industry, you NEED the support of Apple, Google, Microsoft, ACDSee, and the other software publishers to create the mindset of inevitability and superiority. Your decision is just plain dumb. XnView MP beta shows thumbs for afdesign and afphoto files. i think it is out of the box, only installed designer and photo. I also see thumbnail images for Affinity documents in File Explorer on Windows 10. I don't have XNview installed here. I don't use the Windows versions of the Affinity apps so I do not know if they have the same "Save thumbnails with documents" option in Preferences > General, but in the Mac versions this must be checked for Finder to show thumbnail previews -- otherwise, it just shows the generic Affinity app icon. Maybe the same is true for Windows Explorer? Anyway, as I understand it this is implemented as a service provided by the app itself so it is "opaque" & will not reveal anything proprietary about the Affinity file format. Perhaps there is something similar in the Windows OS that could be included in the Windows versions of the Affinity apps & used in a similar way? Usually to support thumbnails for a variety of formats in Windows some custom codec (videos) or app must be installed. e.g. SageThumb extends the range to many formats incl. PSD etc. that are not supported out of the box. To see SVG thumbs there is another third party tool that needs to be installed etc. But maybe if a thumb is saved with some unknown format in a specific way windows 10 picks it up? I am not sure if I ticked the option to save thumbs with the files around the same time I installed XnView so it may be unrelated to XnView. I was just about to send you a screenshot to prove .afphoto files were not recognised on my Windows 10 machine but the thumbs generated before I could do that. Very happy to be wrong! Sorry to be blunt, but you are being delusional. Or incredibly pretentious. Or both. That strategy is never going to fly, ever! Do you seriously think that in order to be able to use Affinity Photo effectively, we are supposed to want to use your DAM? To like it? To change all our habits? Our workflow? Do you plan to support all the file formats supported collectively by all the DAMs we currently use? Do you seriously expect us to keep our pictures in a file format only known to a tiny company who might not be there in 5 years, who strongly commits to not document the format and makes claims it is very difficult to document and understand? At the very least, you should offer a choice of default format between your own, tif and psd, and all 3 should support the same level of editability. The ease of saving should be the same whatever the default format the user chooses. I bought your product because I decided to make a $40 bet on something that looks very promising. Your attitude in this thread appears to make it a losing bet. I can certainly understand your your reasons for keep the specs of afphoto files to yourselves at this time. It does make for a much more rapid development (improvement) of the format if there are no outside constraints. But, if Affinity Photo is to become widely used, it must integrate easily with the workflows of those of us who use programs like PhotoMechanic, Photo Supreme/IDImager. ADAM, etc to manage our images. At the moment I cannot work with afphoto files because they cannot be seen by PhotoMechanic and Photo Supreme. The 512 pixel png file embedded in an afphoto file is not ideal for previewing, so It's really good to hear the the issue of previewing images embedded in afphoto is being reviewed. Once you have improved that apects of afphoto, PLEASE let others know how to recognise afphoto files. Much as I really like the flexibility of afphoto, I am going to have to stick to writing to PSD files in order to fit into my workflow. At the moment, there is not even a way to modify my workflow in a way that would allow me to use afphoto files routinely. For that to happen AP must integrate with PhotoMechanic and Photo Supreme. But we are on a bleeding edge here and most of us, I expect, are willing to wait a little to get the missing things that we need. PS. the afphoto file format, as Ben said earlier, is very different from other image formats. It seems to be very efficient, I just did an experiment with one of my larger, many layered, PSD files which is 1.4 GB ( yes GB) in size. It took 20 sec to load in AP and 15 sec to load in PS CC 2017. I saved it as an afphoto file. It was a smaller file (246 MB) having rasterised the PS smart layers. But it loaded in less than a second. The same file exported back to a PSD file was 930MB but no longer had smart layers. So, for sure, afphoto files are worth working with. But is the advantage worth the inconveniences in the workflow? if i'm not mistaken, the file format used is not the format where you save your pictures in. it is only for the files you are working on. like most software apps do have their own file format , like psp for paint shop pro, qxd for quarkexpress. Indeed, and one cannot say that Paint Shop Pro and Quark Express are hugely relevant in today's market. Like many others, I do not have a separate file format for working and one for storing and have no plan to change that. It does not make sense, because I often go back to edits I made some times ago, occasionally I revisit old works and having to start all over would be a waste. Insisting on making the afphoto a non-changeable default in Affinity Photo makes it totally impractical for opening a raw file and saving a file that any DAM can use. Period. And that means continued irrelevance for Affinity Photo because almost no pro will even consider it and most amateurs will give it a try, like I did, and only use it for a while until they realize the qualities of the program are not enough to justify the added inconvenience. We use FileRun on our webserver, which works great with Photoshop and Illustrator files as well as all of the standard image stuff. I would have to agree that not allowing 3rd party applications to pull out a thumbnail seems very short-sighted. While the speed at which new features are developed would probably make the native Affinity file format impractical as an interchange or final output/archival format, some fundamental details that don't change, such as accessing thumbnails, metadata, page sizes etc. would of course be extremely helpful. However, I do agree with the sentiment that a completely closed file format makes it problematic to blindly trust it with one's data. This is always an issue when a software is discontinued or a company goes away. We have seen this with Adobe/Macromedia FreeHand (most of the file format has been painstakingly reverse engineered, but to my knowledge certain parts still remain undecoded), Aldus/Adobe PageMaker, the proprietary chunks in Macromedia/Adobe Fireworks PNGs that hold the editable data, or recently, Serif's own complete Plus range. When your last computer (or VM) that can still run the original software breaks, as a user, you are basically locked out of your own files and can no longer make any edits. I think it would be a good middle ground if Serif simply made a public, legally binding commitment that in any scenario in which the software is discontinued, the company goes away, or read compatibility with old file format versions is broken, the complete file format will be documented and a full official specification published for anyone to freely access. Another vote for file format transparency. I also work in QuarkXPress, and now I have to maintain two versions of each image, a layered .afphoto, and a placable .tif. Really annoying if you try to fine tune images as they look in the context of a larger document. While speed improvements may be important for some large files, for many users the trade-off is rather tilted towards compatibility. Alternatively, have the option of saving AP files in .psd format by default. I agree that the afphoto and afdesign file formats should be an open spec. I can understand keeping it closed during development but once the format is near final, please open it up so that it would be possible to preview affinity images in various ways as well as open in third party software. It will improve your sales, not hinder them. If the logic behind keeping it a closed ecosystem is to prevent a loss of sales, it is not correct.